Editor’s Note: This story was first published by Poynter.org. Republished with permission. The accounts look like news organizations, museums and public figures. They publish what appear to be real photos and rack up thousands of followers. But something is off. They have extra letters on the ends of their usernames — such as @financialtimess. And all of them have almost the exact same bio. The network of accounts Poynter found on Instagram seem to be run by a Los Angeles-based company that promises to boost followers and interactions for Instagram users. Plans range between $16 and $90 per week and include everything from automated liking and audience targeting to content strategy and marketing reports. 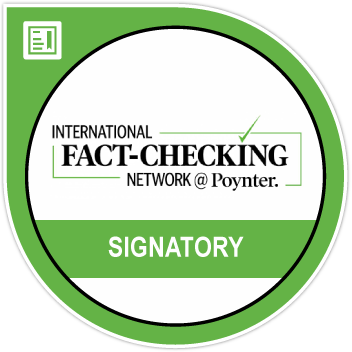 Using a simple Google search, Poynter was able to identify at least 30 fake profiles that link to Social Cat, including four that are posing as profiles for media outlets like Vogue and National Geographic. Others rip off content from real accounts for businesses like Starbucks and public figures like Nicki Minaj. Eight of the profiles Poynter found exclusively pretended to be Gary Vaynerchuk, an entrepreneur with nearly 4 million followers on Instagram. Ironically, he’s a longtime investor in Facebook — which owns the image-sharing platform. Instagram has long been littered with fake accounts, particularly of people pretending to be celebrities. And in the past few years, selling social media users more likes and followers has become a cottage industry. Put all those things together and what do you have? Poynter repeatedly reached out to Social Cat for comment but had not heard back as of publication. According to Instagram’s community standards, users are not allowed to artificially collect likes, followers or shares. Additionally, spam or fake accounts are liable for removal from the platform. Poynter sent all 30 Social Cat profiles — whose joint followings totaled more than 100,000 — to Instagram. The company said it removed 22 that violated its guidelines. Instagram told Poynter it leverages a combination of automated and manual systems to catch and remove spam content, which it claims makes up a small fraction of its monthly user base. Each day, the company runs 1 million checks per second and blocks millions of fake accounts at registration, a spokesperson said. But some of the accounts Poynter found were posting on the platform for months before they were taken down; the fake Vogue and National Geographic profiles had existed at least since May. And Van Ess said scam Instagram accounts are hard to police because they are usually created and taken down in short succession. The goal is to bolster traffic to a specific company or service while avoiding detection by the company’s automated enforcement mechanisms. Not sure whether that account you’re following is a scam or not? 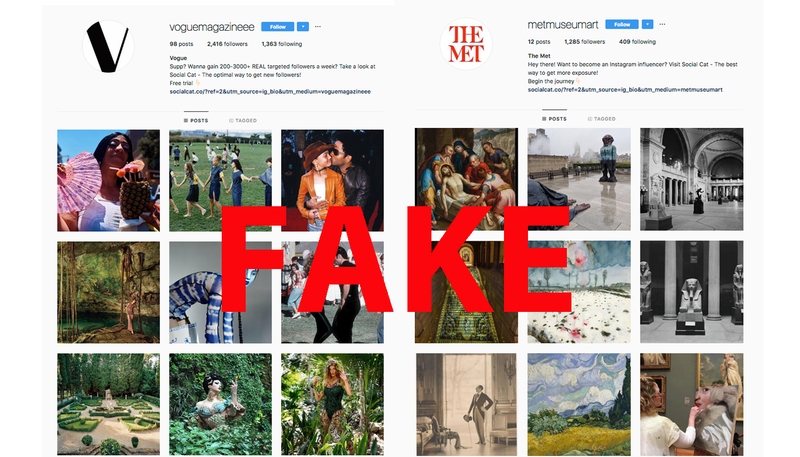 Check out The Verge’s guide to spotting fake accounts on Instagram.